Hasbro 1999 Star Wars Qui Gon Jinn Green Lightsaber Lucus Sound Effects 39"
Star Wars Qui Gon Jinn extendable lightsaber with a green blade. Lights and sounds. Batteries not included. Star Wars Celebration 2019 Qui-Gon Jinn Road to Celebration Trading Pin SOLD OUT. Condition is Used. Shipped with USPS First Class Package. Its in beautiful shape and is in hand. STAR WARS CELEBRATION CHICAGO. Ive been attending Celebrations for years and have provided the most extensive range of exclusives including things not made available to the general public. Of course the Jedi Master is hand painted and finished to the highest standards which Sideshow is famous for. 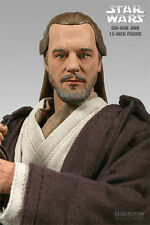 So don't be left peddling on Coruscant for not capturing this Master Jedi for your Star Wars Collection! Galoob -Star Wars Episode 1 - Action Fleet - Gungan Sub - Micro Machines. Each detailed replica is loaded with movable features for galactic battle action. From my complete collection! Non-smoking house and no direct sunlight. These are all as perfect as you could ever want. Neopixel setup. Neopixel blade. Blade plug with neopixel units. This is a fully installed KR Sabers Qui-gon Jinn hilt that features Demo video coming soon. A rare hilt from KR Saber's limited run. Sold out in minutes a few years ago. It is new in the box and sealed. There is a little bit of wear in couple of places on the box. Count Dooku Red (lights up / makes noise). Mace Windu Purple. Qui-Gon Jinn Green. Electronic lightsaber, extends to over 3 feet. Requires 2 “C” batteries (not included). 1999 Hasbro. Star Wars Light Electronic Sabers. Star Wars Celebration Chicago 2019 Exclusive Qui-Gon Jinn Skydragon patch. Condition is New. Shipped with USPS First Class Package. Hasbro/Lucas Ltd made in China. No. 84524. Age 4 Great condition. I have many other Star Wars toys for sale right now! QUI-GON JINN BATTLES DARTH MAUL. Up for bid is a Star Wars Episope I Qui-gon Jinn Hasbro doll. Condition is New. Box has been opened and doll was taken out but never used. Box is a little crushed and torn on the bottom but not bad. Comes with everything, thanks for looking and no returns. Shipped with USPS Priority Mail. Star Wars Episode-1 Qui-Gon Jinn figure with green lightsaber and talking Commtech chip. Still in new condition. Unopened after twenty years. He was tasked with negotiating a peace treaty with the Trade Federation and planet Naboo. That quickly turned to protecting Princess Amidala and the planet from the Trade Federation's droid army. Brand New VINTAGE 1999 Hasbro Qui-Gon Jinn Episode 1 Electronic Lightsaber. Condition is New. Shipped with USPS Priority Mail. Jedi Aquata Breather. Second pair of hands to hold various accessories. Fully articulated body with 30 points of articulation. BUY FROM US! Blast From The Past. All of our copies are new and unused with only very minor corner dings from years in storage, though most are in near perfect condition. The picture is for identification but you will receive one as shown. Smuggler’s Bounty Exclusive Qui-Gon Jinn T Shirt Size XL Star Wars Funko POP. Condition is Used. Shipped with USPS First Class Package. DON'T MISS OUT AND ADD THIS TO YOUR STAR WARS COLLECTION ! IN GREAT CONDITION (SEE PHOTOS) . THIS IS FROM MY PERSONAL COLLECTION. - I WILL MAKE EVERY EFFORT TO RECTIFY THE SITUATION. Star Wars Celebration Chicago 2019 Qui-Gon Jinn Phantom Menace Trading. Condition is New. Shipped with USPS First Class Package. Star Wars Episide 1 Qui-Gon Jinn Collection 1 Hasbro 1998 Condition is New. Shipped with USPS First Class Package (2 to 3 business days). From my complete collection! Non-smoking house and no direct sunlight. These are all as perfect as you could ever want. This week is ROTS Loose! all sealed, unopened boxes. Note, if purchasing from Alaska or Hawaii, additional postage may or may not be required. QUI-GON JINN Star Wars Celebration Chicago 2019 Exclusive Pin. Condition is New. Shipped with USPS First Class Package. Star Wars Qui-Gon Jinn Jedi Master w/Lightsaber. Up for sale is Star Wars Qui-Gon Jinn Jedi Master w/Lightsaber. Condition - NM ! with Lightsaber No Comlink. Lot of 3 BNIP Qui-Gon Jinn Action Figures 5 BNIP Obi-Wan Kenobi Action Figures 2 BNIP Cinema Scenes (Jedi Spirits & Tatooine Showdown). Jedi Spirits box with small scuff on the top, 1 Obi-Wan Figure with bubble dent. Otherwise, in excellent condition. (It is in near/mint condition.). All of my Evolutions are Unused Mint condition. Loose complete new condition!From my complete collection! Non-smoking house and no direct sunlight. These are all as perfect as you could ever want. 2017 Star Wars Celebration Qui Gon. Set of 2, Darth Maul and Qui-Gon Jinn interactive talking banks. Interactive, connect together and duel with their lightsabers when coin is inserted or just press the button. Darth Maul is missing the cap on the bottom of his bank.